August 29, 2012. Seth Keel has checked in as the new owner of Sinn Fein, Yankee #189. Your webmaster and Seth have exchanged a couple of emails, the latest of which is below. Her first voyage with Seth, often a challenging one, was by trailer, and was - challenging. Pending receipt of new pictures we'll use a picture of Sinn Fein we have from former owner John O'Toole. Yes, the deal is done. We are now the proud owners of Sinn Fein. The trailer broke on the way home, so we had to make an emergency stop. The boat doesn't seems to be damaged in any way. We lost the back window in our van when the anchor went through it, but the rest of the van is unharmed. All in all, no major damage. It was fortunate that we were coming to a stop and were only going a few miles an hour. The hitch mount was poorly welded and had rust cracks through some of the critical welds. I'm surprised it made it as far as it did. So we still don't have the boat, since it's sitting at the trailer shop waiting to get fixed. Well, it's probably fixed, but while it was at the shop I want a bow support put on with a winch, and they said that would take longer to fit into their schedule. We got photos throughout the entire ordeal. Quite the adventure. As for the boat itself... The sole was rotted out. The deck is softening in spots. Bulkheads seem good. Not sure about the stringers. I need to clean out all the trash and clutter in order to really get in to see what we're working with. The rigging seems OK. I'm not sure about the sails, but I think they'll work for a few more years. Some of the deck hardware is leaking and needs rebedding. All the teak needs serious work. Electrical is looking very old and should be replaced. There is a once very beautiful boat somewhere underneath decades of neglect. It's going to be a major project to refit this one. We'll see if I'm up to the challenge. I'm just hoping she's seaworthy and watertight enough that I can play while I work. Otherwise, it could be a long while before she's off the hard again. This boat has a past. Former owner John O'Toole found some old records that came with the boat, and we found out that she was the Anderson's Antigua II, Lake Minnitonka, Minnesota. Click here to go to her. We had a nice email and photo from daughter Arlyn that has to stay with the record of this boat. I am new to the Dolphin24.org site. Thank you for maintaining it. Those of us who have loved the Yankee Dolphin appreciate it very much. 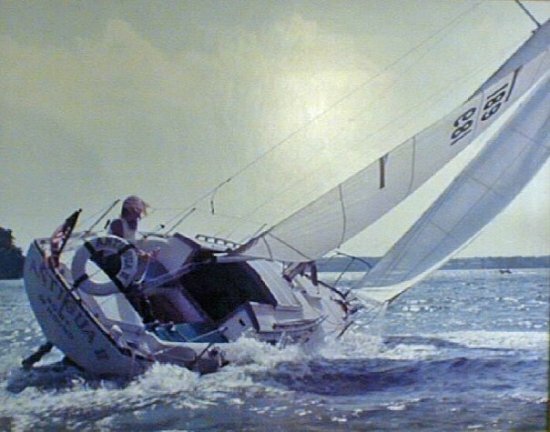 I thought you might be interested in this picture my father took of me sailing our Yankee Dolphin, Antiqua II, in 1977. 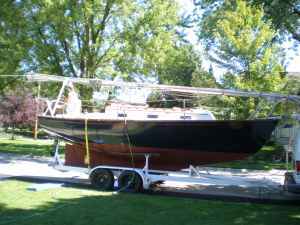 I was a 16 year old girl at the time and was sailing on Cook's Bay on Upper Lake Minnetonka, in Mound, Minnesota. This is a picture of the original photograph. I clearly remember this being my first solo sail on Dad's new boat and being miffed when I spotted my father heading toward me in my grandpa's fishing boat. I was sure he was coming to tell me to "take in the jib" or, better yet, "let out the main," but when he got closer I noticed that he was pointing a camera at me. My annoyance melted away. Enjoy and thank you again for all you do! August 25, 2014. Seth has a new project - a lifting system in a winter workshed. He posted on the Forum to start a conversation inviting comments. Click here to go there. Sinn Fein has been in dry storage for something like 7 or 8 years, just waiting for some TLC. Baby 2 is due in a month and we're deep in renovating our new-to-us house, so 2018 is probably not going to be the year either. We've moved, again, and now have a 20'X35'X16' insulated storage unit that I was hoping to use to get her cleaned up and ship shape again. She's in winter storage locally so our space is usable for other things. Come spring we'll need to decide if we make room again or put her on the market for someone else who has more time for her.